Siemens Industry Automation & Drive Technologies has developed four new Simatic S7-300 controllers with a width of just 40mm: these are standard controllers CPU 315-2 PN/DP and CPU 317-2 PN/DP and failsafe controllers CPU 315F-2 PN/DP and CPU 317F-2 PN/DP. Although they are not as wide, the new controllers with two Profinet interfaces offer considerably more performance and working memory than their predecessors. 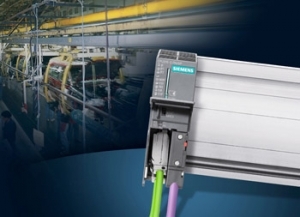 The two Profinet interfaces enable line structures to be implemented easily and cost-effectively. The new controllers execute user programs more than twice as fast, meaning that bit commands now only require 25ns and the times for word, fixed-point and floating-point arithmetic commands are much shorter than before. The expanded functions of the integrated web server enable user-friendly system diagnostics, with automatic page update and a diagnostics buffer for up to 499 entries. Furthermore, the graphical representation of the Profinet IO topology has been revised; this offers a detailed tabular display of the module status of the connected Profinet stations and a direct link to their web servers.